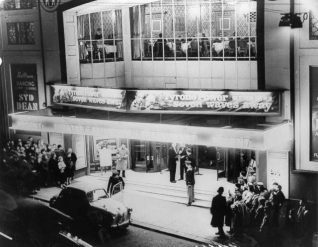 People queuing outside the Regent Cinema. Above the entrance the restaurant can be seen. A banner advertises that Tyrone Power is appearing in the film Seven Waves Away. At this time, there was ballroom dancing was evening with music by the Syd Dean Orchestra. c) REGENT CINEMA: This spectacular cinema stood near the corner with North Street and was opened on 27 July 1921 by Provincial Cinematograph Theatres Ltd at the immense cost of over £400,000; it was built on the site of the Unicorn Inn and several other buildings. The Regent was the first of several giant Brighton cinemas, seating about 3,000 people, and indeed it was considered the most luxurious cinema in the country, the first `super-cinema’. Designed by theatre architect Robert Atkinson, and with a classical interior by Walpole Champneys, it had spacious foyers and galleries, the Ship Cafe, and a Georgian-style restaurant with an orchestra. There was also a side entrance in North North Street at the corner of Windsor Street. In November 1923 the famous dance-hall or winter garden opened in the arched superstructure on the roof which had originally been intended for a roof-garden. 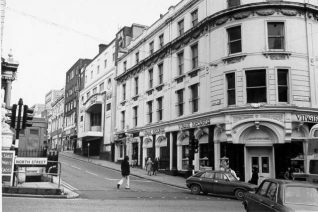 The Regent, together with Sherrys in West Street, was then at the forefront of Brighton’s night-life for many years. Late in 1928 a serious fire destroyed the stage, the organ, and the proscenium arch, but the building reopened on 1 July 1929 as Brighton’s first `talkie’ cinema. The Regent was acquired by Odeon Cinemas Ltd in 1953. In 1962 a giant wide screen was installed, but the ball-room closed in July 1967 to become a full-time bingo hall, and the cinema itself closed on 14 April 1973 to be replaced by the Odeon complex at the Kingswest. 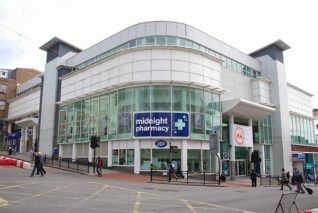 The building was demolished the following year, and the site is now occupied by the Boots store. I can remember everything just as it is shown in the picture. Those public toilets at the Clock Tower were very handy. There was another blue police box down West Street by the SS Stadium. 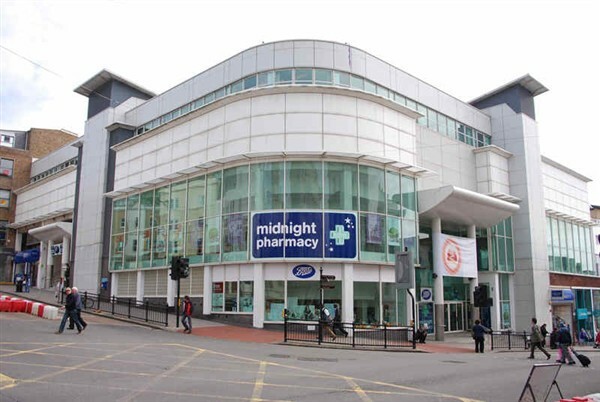 The corner retail shop where ‘Boots’ is now situated was I believe one of the first ‘Virgin Record’ stores (of Richard Branson fame) in Brighton. I think that the Regent Ballroom was still was still in use as a Rock Music Club in, or around 1968/9.